The June 16 issue of WORLD Magazine mentioned the recent North Carolina Inasmuch event in it’s Human Race section. 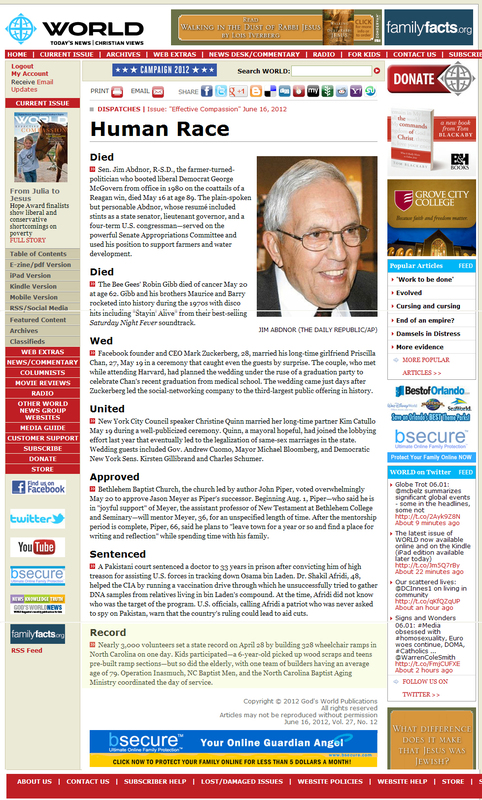 The following article was published May 2012 under Convention News in the North Carolina Baptist website. The article discusses the statewide Inasmuch United (called NC Operation Inasmuch) – and the huge success of the Rampin’ Up initiative to build a record number of wheelchair ramps in one day! After just a couple hours working, Vicky Coerper couldn’t believe the team’s progress. Before the day’s end the wheelchair ramp would be finished, giving her mom a new sense of freedom. “I am very thankful. This will help keep my mom, and her caretaker, safe,” Coerper said. Coerper’s mom, who has dementia and cannot care for herself, came to live with her and her husband about three years ago in their North Raleigh home. Coerper said adding the wheelchair ramp to their home will help her mom be able to get outside on days when the weather is nice, instead of being stuck inside all the time. Coerper’s mom has a wheelchair but it is difficult to navigate in and out of the house, and even inside the house. Coerper’s family is just one of many across the state that benefited from “Rampin Up!” on April 28. “Rampin Up!” was an effort among North Carolina Baptists to build wheelchair ramps for aging adults, as ramps consistently rank among the highest needs of the aging-adult population. 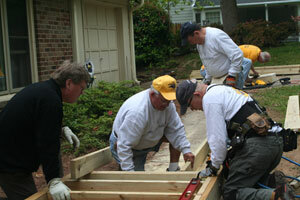 In one day, nearly 3,000 volunteers from North Carolina Baptist churches built 327 wheelchair ramps. North Carolina Baptist Aging Ministry (NCBAM) partnered with NC Baptist Men to coordinate the initiative as part of the larger statewide Operation Inasmuch. Operation Inasmuch is an event that encourages churches to choose one day and minister to those in need in their communities through hands-on, practical efforts. After May 5, when more volunteers will participate in community outreach, the total number of participants for this year’s Operation Inasmuch will include more than 170 North Carolina Baptist churches, representing about 50 counties. “People of all ages can find themselves confined to a wheelchair. But as we age, the number of people unable to leave their homes because of a lack of mobility increases. They are trapped until someone builds a wheelchair ramp for them,” Gregory said in a statement released by NCBAM. A ramp costs usually costs $700 and takes about eight hours to build. Some churches built more than one ramp on April 28, and Eastern Baptist Association in Sampson County built more than 20 ramps. 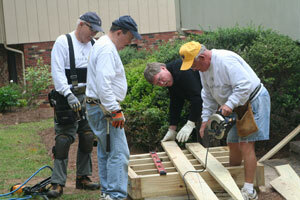 Members from Bay Leaf Baptist Church, known as the Bay Leaf Builders, built two ramps April 28, including Coerper’s. The group includes mostly retired adults. “Just about every week we build a ramp. We are able to share our faith with the homeowners and pray with them,” said Reece Dillard. In addition to “Rampin Up!” North Carolina Baptist churches participated in a variety of outreach efforts through Operation Inasmuch. Members of First Baptist Church in Cary volunteered with Dorcas Ministries, an organization that began in 1968 and is dedicated to helping meet physical needs and to sharing the gospel. Dorcas Ministries serves the community through a thrift store, food pantry, crisis ministry and adult education scholarships. In the past five years Dorcas Ministries has helped more than 42,000 people and provided more than $2.2 million in financial and food assistance. When Manning retired from GlaxoSmithKline he did not plan to enter the workforce again, but serving at Dorcas has provided unique opportunities. “It’s a way to exercise your true beliefs everyday. It’s Matthew 25, ” he said. “One of our visions is to do local missions in North Carolina, and to do missions in the United States and internationally. Touching Lives with Christ and Operation Inasmuch help us get families involved with missions projects,” Major said. 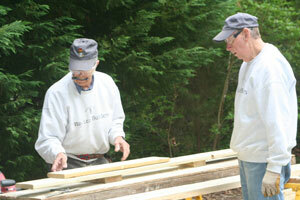 In Scotland Neck, Dawson Baptist Church also found a creative way to serve the community. Their “Relief at the Pump” outreach took place at the Shell gas station on Main Street, where youth and adults spent the morning pumping gas and cleaning windshields. 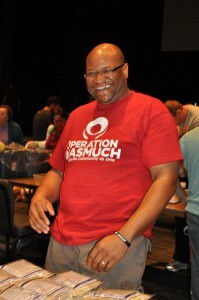 Operation Inasmuch allowed the church to help meet a need and to share the gospel. As usual, Sunday services at churches involved in last Saturday’s Operation Inasmuch were filled with testimonials concerning the reactions of people helped during the one-day missions blitz – as well as the blessings received by those doing the helping. But Cathy Cardwell of Mayodan First Baptist Church said reactions began for her well ahead of Saturday’s multiple projects. 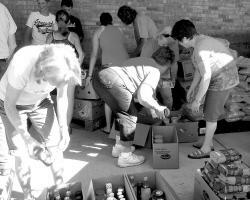 Cardwell oversees the Hands of God food pantry housed at First Baptist and was responsible for helping prepare 100 bags of groceries for distribution Saturday. One of the first things Cardwell noticed was the sharp increase in the cost of filling those bags. Two years ago, purchasing enough food for 100 bags took $1,400. This year the amount grew to $2,200. “It attracts a lot of attention when you go to buy that much food,” Cardwell said. When she started through the checkout line at Wal-Mart with carts filled with canned goods and other food items, Cardwell said people started asking her why she was buying so much. But the pre-event blessings were far from finished. Cardwell said she had to send her husband, Doug, to Food Lion to pick up some remaining items one day last week. 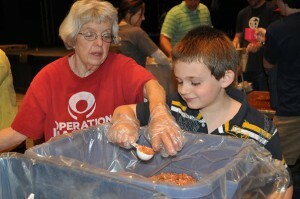 Saturday was the fourth edition of Operation Inasmuch for the Western Rockingham County area. Local churches – including Mayodan First, Woodbine and Comer’s Chapel Baptist churches – joined forces to fulfill a wide variety of missions projects. More than 300 people of all ages worked through most of the day to complete tasks ranging from building wheelchair ramps, painting and re-glazing windows, planting a community garden, giving manicures, handing out quarters at laundromats, mowing lawns and cleaning gutters, washing cars or making no-sew blankets. 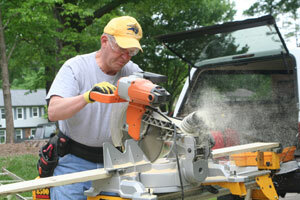 Bill Scheib directed Saturday’s communitywide missions blitz with the help of his wife, Sherry. Scheib said the event carried a lasting buy topamax online impact, both for those rendering and those receiving the provided services. 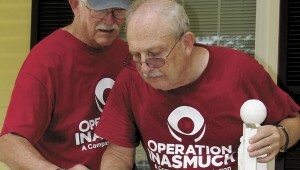 Operation Inasmuch began in 1995 as a one-day outreach project for Snyder Memorial Baptist Church in Fayetteville. The program grew so successful at involving church members with people in their community that it was soon picked up by neighboring churches. Within a few years, the missions project spread to neighboring counties, states and even to Canada and England. Scheib said the focus of the event was changing lives by working together for even a single day. At one point Saturday morning, more than 50 people were involved in the Operation Inasmuch ministry at Jacob’s Creek Nursing and Rehabilitation Center in Madison. While about 30 people gathered in the dining room to sing hymns and gospel songs for residents, another group was visible in the courtyard through the floor-to-ceiling windows along one side of the room. The large crew in the courtyard had been busy since early morning completely remodeling the area. The work included building a waterfall feature, planting new greenery and flowers and adding new birdhouses. While some worked on the landscaping and rebuilding, another crew worked on the walls surrounding the courtyard – painting and re-glazing the windows and trim.